ConvertPlus Version 2.4.0: Disabling Impressions and Deleting Contacts made Possible! This is how we greet each other here in Pune! It is a way to the other and bow to the divine within the person. So… Here we say a loving hello and a Namaskar to all of you! 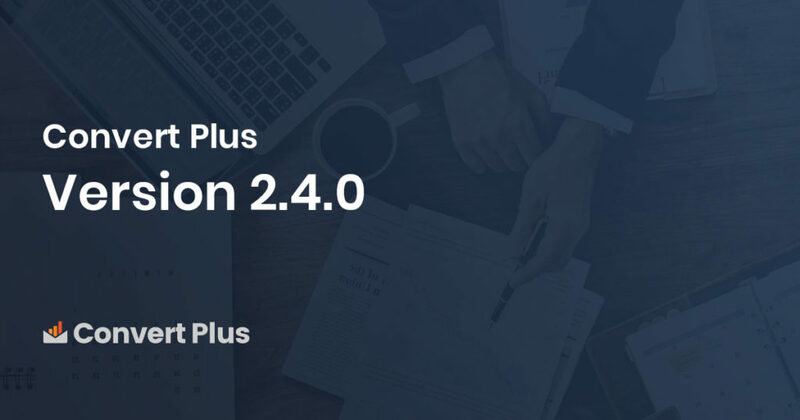 We are back again to share an update… ConvertPlus version 2.4.0! This update comes with some new features that users were looking out for and a few fixes that make our popup plugin more awesome! We received a lot of requests from users asking us to disable the impression count. Therefore, we added an option in the Advanced settings to allow users to disable Impression counts. This should do the trick. Refer to the article here to know more about disabling the impression counts of modules. This is especially for those who wish to redirect users to another page or website after successful submission. Again, a requested feature! If you are concerned about the optimization of your website, and wish to reduce the number of DoFollow links, you now have an option to convert them to NoFollow. Unlike the previous versions, ConvertPlus version 2.4.0 allows you to delete leads from a Campaign under Connects. Earlier, this was only possible within the third party mailer list. Now, we make it easy in ConvertPlus too. Note: The API allows you to add leads in the inbuilt campaign as well as the associated mailer list in the third party software. However, deleting a contact from an inbuilt campaign will not delete the contact from the mailer’s list. Apart from these, you can now add borders and format the font on your toggle buttons for infobars and slide-ins. ConvertPlus version 2.4.0 comes along with a number of fixes, like the Z index issue, modals not working well on Safari, PDFs not downloaded on an iPhone, SSL security issues after site migration and more. Let us take a quick look at the entire changelog in brief. Just another update to grant all that you have asked for. I am sure most of you were looking for a few features and fixes listed above. Therefore, updating your plugin quickly will give you access to all the above making your converting journey even more beautiful! We, at Brainstorm Force are determined to deliver what you are looking for. Whether it is a top selling addon for page builders like the Ultimate Addons for WPBakery Page Builder and the Ultimate Addons for Beaver Builder, or the fastest and best performing theme, ASTRA, which is on its way, we make sure we’ll keep you updated with the features and advancements you are looking for. ConvertPlus version 2.4.0 is just a version to prove that your demands and requirements aren’t ignored. We strive to bring out the best so that you have a wonderful time creating beautiful opt-in forms and popups that convert visitors into subscribers and customers. Since, this is an update most of you were looking for, we recommend you to update ConvertPlus as soon possible. Like always, you can always drop in a Hi or a query or simply get in touch with us! We’ll love to hear from you!